One significant way humans impact the coastal ocean is through the discharge of wastewater from sewage treatment plants, desalinization facilities, industrial centers, and hydroelectric generation stations. Of critical importance is mixing of the discharge with the local coastal waters. The rate, time-dependence, and position of this exchange controls both the concentration of pollutants and their trajectory in the coastal environment. Variability in the exchange is driven by time-dependence in the discharge rate and unrelated variability in the coastal environment. However, environmental engineers and water quality experts typically use steady-state assumptions, or simplified numerical models, to estimate the impact of discharged waters. Over the last 5 years, our group has worked closely with the Orange County Sanitation District and the City of Los Angeles Department of Sanitation to study the distribution and evolution of buoyant wastewater effluent plumes. We have leveraged the fine vertical resolution of the Wirewalker platform to document how coastal variability (principally tidal and wind-forced) impacts the vertical position and the distribution of the sewage plume. Studies like these will ultimately improve our understanding of the impacts of effluent discharge on the coastal environment. Deep-sea mining may well be a common practice in the next 5-10 years; indeed, the first deep-sea mining claim has already been granted in the Bismarck Sea. While it is possible that deep-sea mining may provide a more Earth-friendly means than terrestrial mining of obtaining materials needed for electronics and batteries, the environmental impacts of this practice are far from understood. The biological impacts on seafloor ecosystems have been examined to a degree, but the physical effects are nearly unexplored. One of the least well understood is the impact of “tailings plumes,” which are the sediment-laden water pumped back to the sea after the mining ship harvests the materials it seeks. These descend downward until they reach their target density, a depth that is hard to predict given the variable stratification and poorly known entrainment of ambient fluid as the plume descends. Then, the plume spreads as a gravity current and is swept around by the ambient currents. In collaboration with MIT, we seek to create full-scale plumes and to image them with our tools in order to better understand their ultimate fate - how far they will spread, their final depth, and what impact they might have on local ecosystems. Our ultimate goal is to develop techniques and protocols for proper assessment of the environmental impact of these practices. 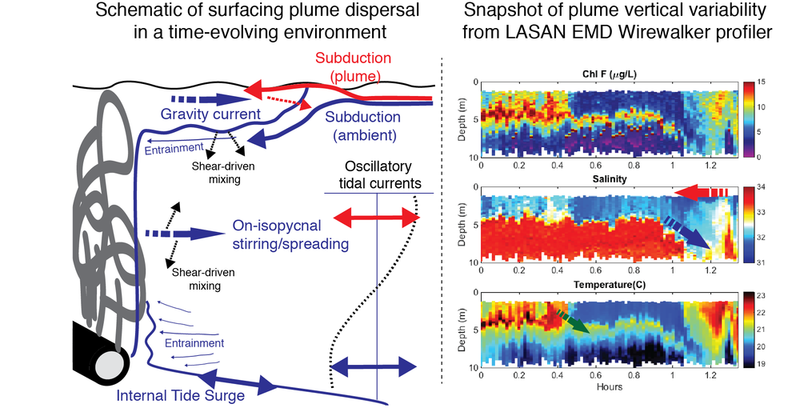 CASE: Schematic of plume dispersal pathways in a complex, time-dependent environment. Schematic of plume dispersal pathways in a complex, time-dependent environment. The density of the plume as it reaches the surface is a function of the density in the ambient waters at the time of discharge. Since most mixing happens within meters from the discharge location, the near-bottom ambient temperature and salinity is of primary importance. The near-bottom temperature varies with the internal tide, implying time variability in the plume density. On occasion, the surfacing plume can be cold enough (i.e. dense enough) and the adjacent, aged plume waters warm enough, that the surfacing plume waters can subduct and spread at depth (red and blue arrows on the right hand panel). In such circumstances, tracking lateral dispersion is complicated by the difficulty of measuring currents at depth along a particular trajectory. Thus the three-dimension environmental variability of the discharge location, as well as discharge/environment feedback, are critical to predicting plume dispersal. How does coastal variability impact sewage plumes?